The three silver Tibetan repousse beads feature elaborate swirl patterns, which form the figure of a lotus. The lotus flower is one of the most important of the Eight Auspicious symbols associated with Buddhism since it is closely related to the idea of enlightenment. As it grows, the lotus rises out of the mud, passes through the water, and rises above to bloom. It portrays how the soul can pass from the primordial mud of materialism through the waters of experience and into the sunshine of enlightenment. 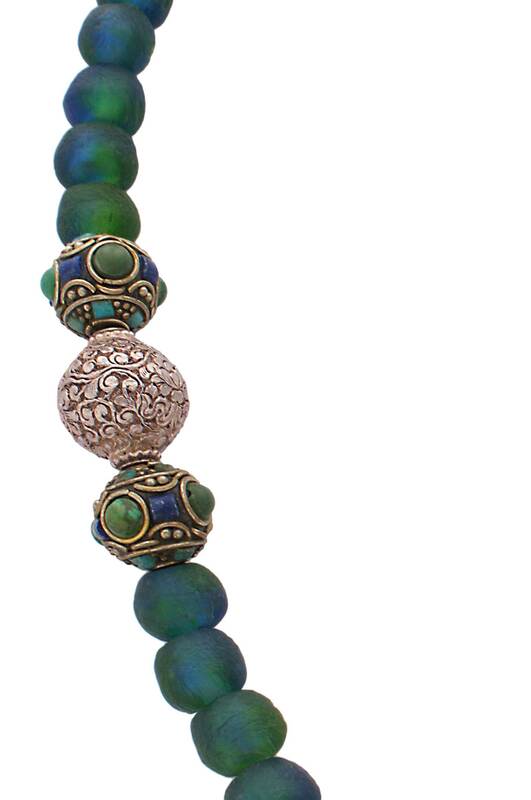 The silver repousse beads are hugged by Tibetan gemstone chip beads. 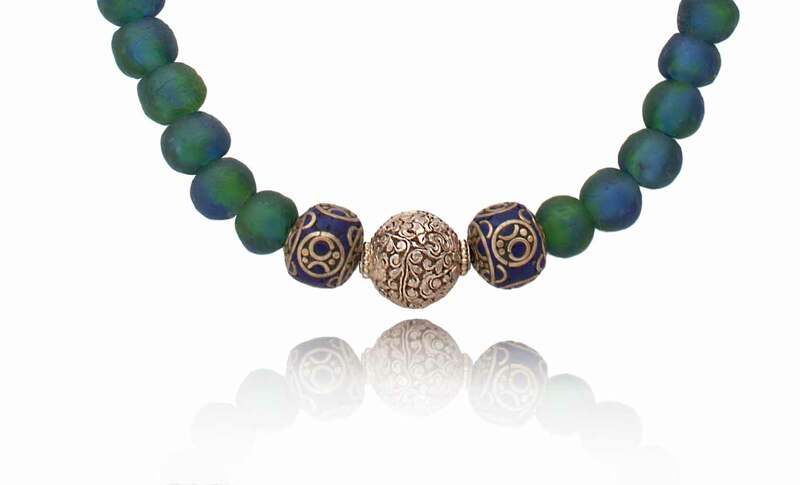 One style features Lapis Lazuli with silver, while the other is a combination of Turquoise and Amazonite. 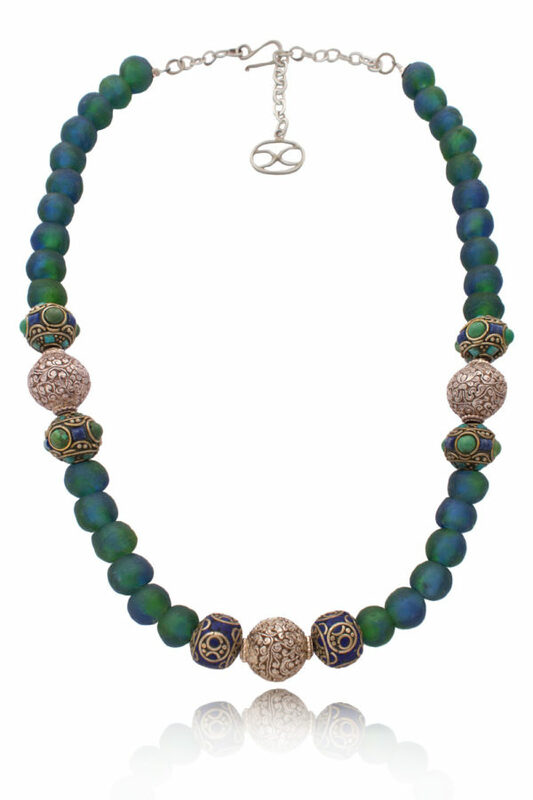 In Tibetan Buddhist jewellery, Turquoise signifies the limitless height of the sky or infinity, while Lapis Lazuli represents that which is pure and healing and is said to be able to cure those who wear it. The gorgeous Ghanaian glass beads are made by pouring fragments of recycled crushed glass into clay moulds, which are then fired in kilns. Once cooled, the beads are polished on a stone with water and sand and rubbed vigorously against each other to obtain a smooth finish. As well as being a popular fashion accessory, the beads are profusely used during the initiation rites for young adolescent girls into womanhood and adulthood in some West African cultures. Some believe that the beads possess special powers for healing or protection. Bring the elements water, earth and air to your accessories collection with the calming colours of Aziza; you’ll never tire of its mesmerising flair!